The following guideline contains the RDS manuscript submission information and publication policy. For a printable version of this information use the 'Print page' link in the footer of this page or download the PDF version. 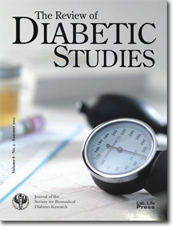 The Review of Diabetic Studies (RDS) is a journal published quarterly by the Society for Biomedical Diabetes Research (SBDR). Decisions concerning the acceptance of submitted manuscripts considered for publication in The RDS remains with The RDS Editorial Board. The Editorial Board appreciates manuscripts containing original work of scientific thoroughness. Papers should present novel insight into biological mechanisms, principles, biomedical methods or treatments. Papers that duplicate the content of other previously published manuscripts are considered to be unacceptable unless they review particular issues. In the latter case, authors should arrange the topics with The RDS editors. or a text file should be attached when using the electronic online submission. You may also send your paper by e-mail to The RDS Editorial Office. The manuscript must be written in English (US style) and should be accompanied by a cover letter. Submission of a paper is held to imply its contents represent original or unpublished work, and that it has not been submitted for publication elsewhere. If the author has submitted related work elsewhere, or does so during the term in which The RDS Editorial Board is considering the manuscript for publication, then the author is responsible for providing The RDS with details. It is the policy of The RDS not to charge the author a submission fee. There is neither a page fee nor is any payment made to the authors. Any manuscript containing original work of scientific thoroughness submitted for publication in The RDS will be reviewed by two peer-scientists. The Board is endeavored to provide final decisions within two months of receipt. The decision will be accompanied by the reviewers' and/or editors' comments. Manuscripts may be rejected, returned for specified revision, or accepted. It is the intention of The RDS Editorial Board to publish articles online immediately even if they are still in press and within the next three months in print after acceptance. The Editorial Board is also endeavored to get accepted manuscripts indexed in PubMed. Articles will be available currently on the journal's website and on the Diabetes Open Directory. The responsibility for the content of published manuscripts remains with the author(s). The Editorial Board does not assume responsibility for the authors' views or statements. In the case of publication the authors convey the right to publish the manuscript to the SBDR. To this end the following declaration must appear on the last page of the manuscript: "On behalf of all co-authors of the manuscript on hand (insert title of article here), we ensure that the content represents original or unpublished work and has not been submitted for publication elsewhere. We also ensure that all authors named on the title page of this manuscript have contributed to the article's development and have approved the finally submitted version. On behalf of all co-authors, we transfer the right to publish the manuscript in print and online (in parts or as a whole) to the publisher (the SBDR) and allow publication and storage in third party repositories (such as Medline, PubMed etc. ), should the manuscript be accepted for publication. We retain the right to use the article for further purposes even after publication in The RDS. We assure to refer to the RDS (i.e. the SBDR) as the publisher of the original article in any cases of further utilization. The sender of the manuscript on hand declares upon submission that all co-authors have read and approved this declaration and that they agree that the declaration is effective upon submission to The RDS Editorial Board." The declaration does not need to be signed when you submit your manuscript. In the case of acceptance, a copyright agreement form containing the same wording as the declaration above must be signed by all co-authors and sent by post to The RDS Editorial Office before publication. Download the form for the copyright agreement here. The copyright remains with the authors as long as the manuscript is not accepted for publication. The right to use the results presented in the article for purposes other than publishing (e.g. patent licensing, commercial use, further publication etc.) remains with the author(s) even after publication in The RDS. This policy expresses the society's and the editors' intention to appreciate the authors' right to retain their intellectual property. However, in all cases of further utilization the author(s) are obliged to identify The RDS as the publisher of the original article. Any utilization by others than the author(s) of the original article requires the written permission of the SBDR as the copyright holder and publisher of The RDS. Reports on conferences, lectures, workshops etc. A description of how to prepare each type of article can also be found in the manual for manuscript preparation. Submitted laboratory research manuscripts must contain a study protocol/approval. Any human or animal study must have been approved by the authors' affiliation. If human patients are involved in the study, then they should not be referred to by name. Furthermore, the patients' consent must be indicated in the paper where appropriate. Studies involving human patients must adhere to the Declaration of Helsinki principles, which must be declared by statement. Animal studies must entail a statement that the Principles of Laboratory Animal Care (NIH, No. 85-23, 1985) were followed. Authors are asked to reveal any financial, institutional, corporate or patent-licensing arrangements associated with the submitted paper, if these are liable to trigger a conflict of interests. The RDS affirms to handle this information confidentially. If such information is not provided by the author and publication of the manuscript causes conflict with other interests, The RDS will not assume responsibility for the contents of such articles in any way. The authors are requested to write the manuscript in a manner such that the results are verifiable, and to make materials and data available to other researchers in order to verify the conclusions of the paper. Genetic structures, cell lines, and protein structures used in the experiment should be accessible to the scientific community. Original nucleotide, amino acids sequence, protein, or structural data, as well as other genetic data must be submitted to GenBank, the European Molecular Biology Laboratory (EMBL), or the DNA Databank of Japan (DDBJ). Protein/peptide structures should be submitted to the Protein Data Bank. The accession number should appear in the paper where appropriate. The Editorial Board welcomes comments on articles that have appeared in The RDS. If you consider submitting a comment, send a copy to the author of the article you comment and explain that you are considering submitting a comment to The RDS. The author's responses to the comment should be included with the submission of your comment to The RDS. Alternatively authors may use the electronic submission form for comments on the DOD homepage. This ensures automatic notification of the author(s) of the original article. Comments accepted for publication in The RDS will also appear on the DOD homepage. The DOD online submission form for comments on published articles may be accessed by selecting/searching the relevant article in the directory first, starting at the DOD Homepage. Then click "view details of the article" in order to access the submission form for your comment. If an author does not respond to your letter after a reasonable amount of time, then this should be explained in the submission. Authors will be invited to submit for consideration a reply to any accepted comment of this kind.